Taco Bell announced in January that it would test its first dedicated vegetarian menu, and would debut new vegetarian dishes in 2019. Now, we have a peek at what those menus will look like. Taco Bell said in a press release it has chosen Dallas as the test market for its vegetarian innovations, with Nation’s Restaurant News reporting the chain will test the menu at approximately 200 locations there. 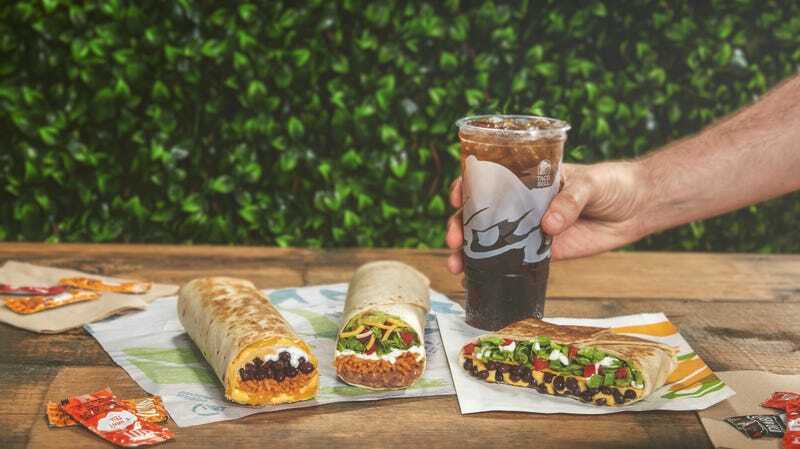 The three specific vegetarian menu dishes include a Vegetarian Crunchwrap Supreme that substitutes black beans for meat, a Vegetarian Quesarito that also includes black beans, and the 7-Layer Burrito. The vegetarian menu isn’t only made up of new dishes, though; it also unifies all of Taco Bell’s existing meat-free foods into one section, streamlining the ordering process for vegetarians, vegans, and flexitarians. Taco Bell said in January its menu already contains 38 vegetarian ingredients, like pinto beans and cheese, 28 of which are also vegan. Unifying them all under a specific vegetarian section just makes the menu simpler to navigate. It’s worth noting the Dallas menus are only a test, and a national rollout might not contain exactly these dishes or ingredients. According to NRN, about 9 percent of meals ordered from Taco Bell are vegetarian, with the black bean burrito ranking as the second most popular item ordered nationwide, behind the crunchy taco. All ingredients on the new vegetarian section are certified by the American Vegetarian Association. It’s yet another step forward for fast-food vegetarian options, which also include Burger King’s new meatless Impossible Whopper, White Castle’s Impossible Slider, and Del Taco’s new trio of Beyond Meat options. The overall vegetarian menu is a logical step for Taco Bell, which has seemingly already earned a reputation as a vegetarian-friendly fast-food destination. Everyone knows ease of ordering is key at Taco Bell, so grouping vegetarian items together seems like a no-brainer.